KUALA LUMPUR (Nov 17): The benchmark FBM KLCI edged lower to close 7.31 points or 0.4% down today, in line with weak market sentiment in other Asian markets, although there was strong demand for Chinese stocks as the Shanghai-Hong Kong Stock Connect makes its debut. The bellwether index settled at 1806.48 points at 5pm. JF Apex head of research, Lee Chung Cheng, told theedgemarkets.com that the local market is still suffering from weak sentiment as investors continue to take profit due to lack of near-term catalysts. “It (The market) is still trading sideways. Investors are cautious and continues to take profits on small- and mid-cap stocks,” he said over the telephone. Bursa Malaysia saw a total of 1.41 billion shares changing hands, with the value at RM1.39 billion. There were 245 gainers and 532 decliners, while 286 counters remain unchanged. Top gainers include Far East Holdings Bhd, Petronas Chemicals Group Bhd and Emas Kiara Industries Bhd, while decliners were led by British American Tobacco (Malaysia) Bhd, Petronas Dagangan Bhd and Asia File Corp Bhd. The most actively traded stock today was Muhibbah Engineering (M) Bhd, with over 41 million shares traded. 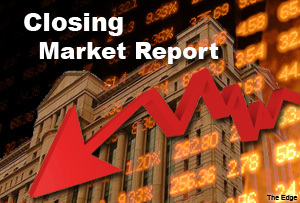 Regionally, Hong Kong’s Hang Seng declined 1.21%, Japan’s Nikkei was down 2.96% while South Korea’s Kospi was marginally lower by 0.08%. According to Reuters, Japanese stocks today marked their biggest daily drop since August, following news that Japan unexpectedly fell into recession in the third quarter. This helped the yen rebound from a fresh seven-year low against the US dollar. Meanwhile, Bloomberg reported that investors rushed into Shanghai shares on the debut of the Shanghai-Hong Kong Stock Connect, buying the maximum amount allowed as China opens up its US$4.2 trillion market.